Airships are away in the Detroit Tigers empire as I write. After a crash landing at the final destination of the team’s only West Coast trip, the Tigers limped back to the Motor City, and promptly (indeed, retroactively) placed Octavio Dotel, who has been pitching without a functioning elbow since Oakland, on the disabled list. In immediate need of bullpen reinforcements, GM Dave Dombrowski & Co., air traffic controller furloughs be damned, revved up the sky fleet. The first move was to bring the franchise’s top relief prospect, Bruce Rondon, in from Toledo, something that admittedly is unlikely to require the services of a jet airliner. But then! Wheels up! 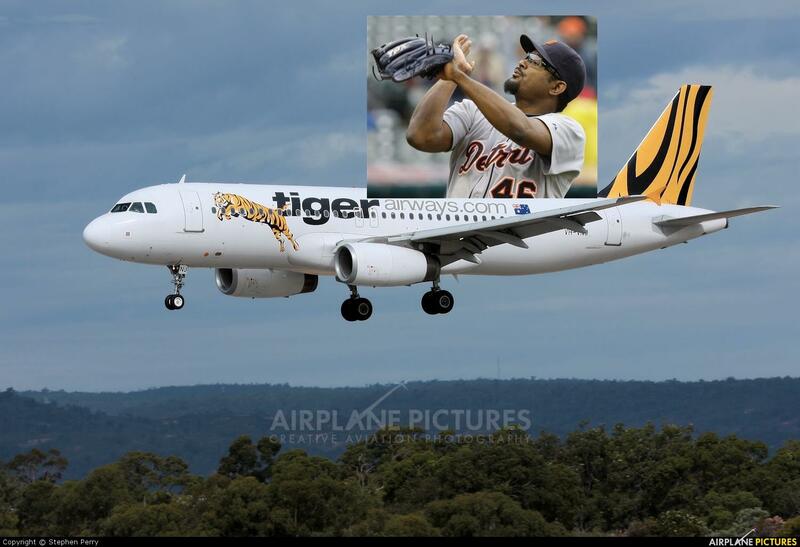 Jose Valverde is on a flight to Detroit RIGHT NOW! The town and team turned on the once-perfect (49-0!) reliever after a down year last season, but now, in their need, redemption? The front office is mum for now, but the implication from Valverde’s comments this evening is that, at the end of his short-term minor league contract, he will sign a one-year contract with the club in Detroit. What does all of this mean for a should-be frontrunner floundering in third place in the weak AL Central with a .500 record? Even though it’s early, and fans of baseball teams that struggle early love to rail against “small sample sizes,” we can set aside results and other numbers and acknowledge that the bullpen was working way too hard this month, and two fresh, if unsteady, arms are sure to provide at least temporary relief for a staff that seems like it could use a collective deep breath. For Rondon, my hope is that he’s ready for the big leagues. For Valverde, I just hope he has enough left to allow the coaches to use him in a way that helps the team. That may be ending this jet-set flourish with something of a sigh, but let it be, in part, a sigh of relief as you remind yourself that at least it wasn’t Brennan Boesch’s birthday flight that landed at DTW this evening. Never hurts to ask, and last year’s video was cool. Staying in the Soul Department, Max Scherzer, who finally is starting to get the attention he deserves for his on-field work as an ace pitcher, took a heartbreaking look back at what was happening in his family off the field last season in this excellent article on ESPN.com. While a few details leaked out about the reason for Max’s sudden, brief departure from the team last summer, this was the first time I’d read the full story. It’s a must read for anyone, and it easily is the best thing written about a Tiger this year. If you know who Mark Fidrych was, you probably are either a Tigers fan or a baseball fan older than the average age of the current Tigers roster. Sports on Earth has a top-notch interview with Doug Wilson, author of The Bird, a new biography on one of baseball’s all-time most interesting individuals. It’s early, yes, but this ranks as my second-favorite Tigers-related article of the season behind the Scherzer piece linked above. Before Fidrych died in 2009, I saw him throw out the first pitch at a Whitecaps (Tigers Single A affiliate) game. After this series’ last installment‘s heavy focus on hitting, I had to focus on pitching this time around, but we shouldn’t go much further without noting the early season success of Torii Hunter. His offensive success is readily apparent to anyone watching, and he has been a consistent bright spot in an inconsistent lineup. The numbers also show just how well he’s done so far. Rondon and Valverde aren’t the only ones jumping flights to Detroit this week. I’ll headed there too to watch the Tigers host the red-hot Atlanta Braves, and as a recently displaced Tigers fan, I certainly am excited to get back for a game. For any fans who’ve made it to the end of this post: What’s your favorite pregame bar near Comerica Park? We love Detroit BrewingBeer Company and are open to other suggestions. This entry was posted in ALDLAND and tagged bruce rondon, dale earnhardt jr jr, detroit, jose valverde, mark fidrych, max scherzer, mlb, mlive, music, octavio dotel, rick porcello, sb nation, sports on earth, stephen stills, steve miller, tigers, torii hunter by AD. Bookmark the permalink. Tonight’s game with the Royals has been postponed, meaning that instead of seeing Fister and Medlen on Saturday, it looks like we’ll see Porcello trot out to face the Atlanta ace. Of the current starters, I still only have seen those two pitch. Here’s hoping Rick gives up fewer than nine in the first frame and lasts longer than five. Jose Valverde is back as the Detroit Tigers closer. The team announced they signed the relief pitcher to a 1-year major-league deal shortly after their game with the Kansas City Royals tonight was postponed. He will be available out of the bullpen Wednesday as the team’s closer if there is a save situation, manager Jim Leyland said. Leyland said he couldn’t wait to put Jose Valverde’s name on the lineup card and said if he would use him Wednesday in the closer’s role if that situation arises.